Autodesk recently updated their Revit Model Performance Technical Note for version 2014. This document contains a wealth of information related to optimizing Revit files and is highly recommended for all BIM Managers who are using Revit. Here's just one example, that can be found under the "Revit Model Optimization and Best Practices" section. 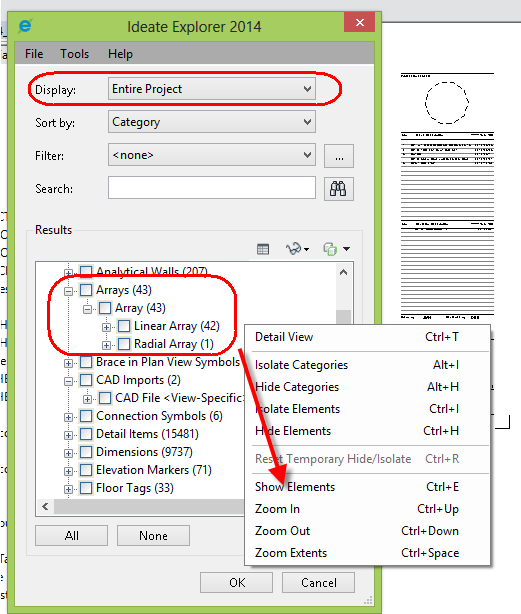 Example: Found under the "Revit Model Optimization and Best Practices" section[/caption] Ideate Explorer for Revit can be used to find Arrays and other problem areas, as shown. Use Ideate Explorer to select all your Arrays at once and then use the ungroup option as recommended by Autodesk for improved performance. You can find "Revit 2014 Model Performance Technical Note" and other Revit-related white papers on our website. Ideate BIMLink for Revit 2014 Conquers Revisions! We've had many Ideate BIMLink customers request access to the Revisions on Sheet properties. These properties allow the project team to identify, on a per sheet basis, whether the sheet is part of a particular issuance (Bid Set, Owner Review, Request for Information, Addendum, etc.). Without Ideate BIMLink using this Revit feature requires that the user select each Sheet and then pick to the "Revisions on Sheet" button and then check the box next to the relevant Revision Sequence - very tedious. View Here! With Ideate BIMLink for Revit 2014.1 we now have access to the revision sequences so that all the sheets can be edited quickly, outside of the Revit environment, saving time and reducing liability. See how: Download the latest version of Ideate BIMLink (note this feature is for 2014 only). SAN FRANCISCO, California - 8/22/2013 - Ideate, Inc., a leading Autodesk Authorized Developer and Autodesk solutions provider offering quality software, training, support and custom consulting services to the Architecture, Engineering and Construction (AEC) industry with a special focus on Building Information Management (BIM), today announced the publication of its most recent Study in Success, "Aurecon Streamlines Seismic Mitigation Work with Ideate BIMLink." Ideate BIMLink customer Aurecon provides engineering, management and specialist technical services for public and private sector clients globally. In the wake of the especially devastating and costly earthquake of 2011, buildings throughout New Zealand are being upgraded and strengthened. The Study in Success explores ways Aurecon is using Ideate BIMLink as the firm designs buildings that employ the most effective known seismic mitigation technologies. These technologies cushion seismic vibrations and allow a building to move during a seismic event with a minimum amount of damage to the building's structural and architectural elements. As the volume and complexity of data for such projects increase, the firm has needed a way to transfer data from an engineering spreadsheet into the Autodesk Revit model without having to transfer it over manually. According to Clinton Maulder, Associate - Buildings, Aurecon, Wellington, New Zealand, "With manual entry, the engineer has to check against all the original source data. If there was a mistake and it wasn't picked up in a manual check, there could be costly delays to remedy on site, or the structure might not perform as well as expected. If we eliminate as many opportunities for manual error as we possibly can, we minimize these risks." By using Ideate BIMLink, the firm has been able to calculate volumes of data and standardize parameter values in Microsoft Excel. Then, the verified data is pushed back into the Revit file. As Clinton Maulder explains, "Being able to effectively deal with source data and eliminate 'double handling' saved time and reduced the chance of errors." Bob Palioca, President, Ideate Inc., says, "We are pleased that Ideate BIMLink has helped Aurecon enhance workflows in its vital seismic mitigation projects. Our software solutions stem directly from our customers' need to overcome stumbling blocks. When we help customers manage data on a vast scale more easily, and when we facilitate the flow of information and collaboration between project stakeholders, our customers can then leverage BIM to its fullest advantage. We delight in their success." Ideate has published "Aurecon Streamlines Seismic Mitigation Work with Ideate BIMLink" online. Read the story here. Ideate, Inc. is a leading Autodesk Authorized Developer with 25+ years' experience in software development and specific focus on Building Information Modeling (BIM) and is an Autodesk solutions provider offering quality software, training, support and custom consulting services to the AEC industry since 1992. Headquartered in San Francisco, California and operating five Autodesk Authorized Training Centers (ATCs) in the northwestern U.S., Ideate is recognized as an Autodesk Gold Partner for Architecture, Engineering and Construction, one of Autodesk's highest levels of authorization. Ideate BIMLink lets users pull data from an Autodesk Revit file into user-friendly Microsoft Excel and push Excel data into Revit with equal ease. Ideate Explorer for Revit is a simple, powerful Autodesk Revit add-on to explore, quantify and manage the 100,000+ building elements in a Revit model. Autodesk, ATC, and Revit are registered trademarks or trademarks of Autodesk, Inc., and/or its subsidiaries and/or affiliates in the USA and/or other countries. Microsoft Excel is a registered trademark of Microsoft Corporation in the United States and/or other countries. All other brand names, product names or trademarks belong to their respective holders. Every year we reach out to our customer base to make sure we're adding value with each iteration of Ideate BIMLink. Our development team just completed another point release for both 2013 (yes, you heard correctly - new features added to the old version!) and 2014. You can learn more about the improvements in our What's New in Ideate BIMLink video. MORE IMPORTANTLY, you can make your voice heard for any new features you'd like to see. All existing Ideate BIMLink users should have received their user survey form via email on 14 August. Those who complete the survey are automatically entered into a drawing to win an iPad mini. The survey ends September 23rd, so if you haven't filled yours out yet, take a few minutes and let us know what you'd like to see in the next version of Ideate BIMLink. The winner will be announced on August 27th. If you are an Ideate BIMLink owner and have not received your survey, you can request a copy of the survey. This post was originally published on the Ideate Solutions Blog. SAN FRANCISCO, California - 8/15/2013 - Ideate, Inc., a leading Autodesk® Authorized Developer and Autodesk solutions provider offering quality software, training, support and custom consulting services to the Architecture, Engineering and Construction (AEC) industry with a special focus on Building Information Modeling (BIM), today announced the publication of its latest Study in Success, "Ideate BIMLink Manages Seen and Unseen Data for HDR Wayfinding/Signage." Wayfinding presents significant challenges to planners who have to collaboratively identify logical traffic patterns, solve problems in architectural and urban spaces, and ultimately help people navigate unfamiliar environments. Immense amounts of disparate data have to be incorporated into BIM models that are primarily designed for other purposes. The Study in Success explores ways the HDR Wayfinding/Signage studio is using Ideate BIMLink to manage the seen and unseen data in its BIM models. By using Ideate BIMLink, the HDR Wayfinding/Signage studio is enhancing workflows, making the best use of Revit- and non-Revit users' time, and shaving from half to two-thirds the time required to create message schedules. HDR is a global employee-owned firm of more than 7,500 AEC professionals in more than 185 locations. Rick Sorensen, Wayfinding/Signage, HDR, says, "With Ideate BIMLink, we can take full advantage of Excel's capability to reveal multiple lines of data at once. We may not be able to see all the data in the model, but we can see it all in Excel." Autodesk Revit-user Sorensen receives input from the non-Revit using members of the studio team in Excel. As a result, he does not have to spend a second thinking about model integrity. Instead, he tasks Ideate BIMLink with pushing the Excel-checked data back into the BIM model. The accuracy is reliable, and that contributes to even greater efficiency. Efficiency allows for a better end result and value to the owner. Sorenson adds, "In the past, I would spend three days at a specific data management task that I can complete now in one-half to one-third the time. As for cost savings, we are limited on our hours per project. Anything that saves us time saves us money." Bob Palioca, President, Ideate Inc., says, "We are delighted that Ideate BIMLink, one of our Ideate developed software solutions, is creating a new workflow solution and contributing to the success of customers such as HDR. Our software development grew out of our desire to overcome gaps our customers faced repeatedly. We continue to improve the flow of information, facilitate collaboration between Revit and non-Revit users, and make data management on a vast scale much easier." Ideate has published "Ideate BIMLink Manages Seen and Unseen Data for HDR Wayfinding/Signage" online. Read the full story here.